Nothing says summer is just around the corner like a fresh-picked apricot. These small golden fruits are often the first signs of summer, as they come into season in May and can be enjoyed through August. 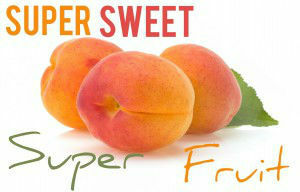 Though a relative of another summertime staple, the peach, apricots boast a more velvety skin and are notably smaller. Their not-too-sweet, not-too-tart flavor is often utilized in preserves, spreads, muffins and more throughout their growing season. Although small in stature, apricots are loaded with nutrition and are a dieter’s dream, with approximately four fruits weighing in at a mere 79 calories. One of the apricot’s nutritional hallmarks is its high vitamin A content. A powerful antioxidant, vitamin A is a key nutrient in maintaining eye health as it battles the free-radicals known for damaging the eye’s sensitive lenses. Over time, free radical damage can lead to the development of cataracts or macular degeneration. Vitamin A also promotes proper immune and reproductive system function, along with maintaining healthy skin, teeth and nails. Apricots also boast a high concentration of potassium, a key electrolyte in the human body. Potassium is necessary to regulate fluid balance and maintain proper muscle function, the most important muscle being the heart. Proper potassium levels are necessary to maintain a consistent and regular heartbeat and keep blood pressure levels in check. These sweet summertime fruits are also a good way to get your daily fiber as they are a good source of both soluble and insoluble fiber. While plucking a fresh organic apricot straight from the tree is one of the more popular ways to enjoy these fruits over the summer, there are plenty of other ways you can incorporate apricots into your summertime meals, snacks and desserts. Slice apricots and dress with melted butter and a sprinkle of coconut crystals. Place on the grill after the main course for a healthy grilled dessert treat. Make your own apricot popsicles by blending them with your favorite juice and freezing overnight in popsicle trays. Add fresh or dried apricots to summertime salads. Incorporate dried apricots into trail mixes that you can enjoy all year long. Add apricots to glazes, marinades or sauces for a fruity twist to chicken or pork dishes. Dried or fresh fruits will add a subtle sweetness to cold summer rice or quinoa salads. Blend fresh apricots with a hint of milk until smooth and top waffles, French toast, pancakes and ice cream. Note: we always recommend gluten-free waffles, French toast, and pancakes. While apricot season is in full swing, incorporate them into your favorite baked goods for a nutritional boost to your favorite sweet treats.